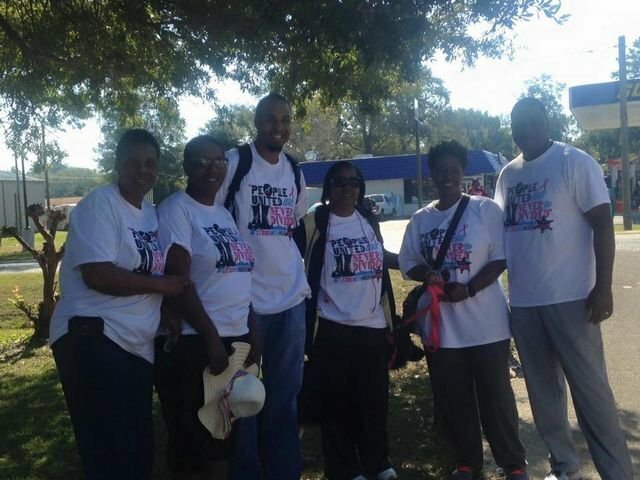 GADSDEN COUNTY, Fla. -- As Breast Cancer Awareness Month wraps up, there's a special journey to mark the occasion. Approximately 30 people joined Gadsden County Sheriff Morris Young in walking across the county. The purpose was to bring awareness to breast cancer. "Not only for breast cancer, but all cancer and all the things that plague this county. It gives me an opportunity to walk across this county and think about a lot of the issues that Gadsden faces," said Sheriff Young. The group started at 6 a.m. Friday. The estimated 34-mile trek is from Chattahoochee to Midway. Some have a personal reason to put an extra pep in their step. "I'm a 20-year cancer survivor," said Gadsden County resident Shirley Griffin. Shirley Griffin is a survivor of ovarian cancer. She said, "I love this. There's nothing else that can make us aware besides doing this here, listening to the news, going to the doctor and getting checked out. I love this walk, every year. Every year!" 13-year prostate cancer survivor, Bennie James Johnson has participated all three years of the walk. He said, "If you keep the faith and get yourself checked out from a doctor in an early stage in life, you will survive longer in life." Not only do the walkers have the support of each other, but, there's been a lot of support from the community members along the way. Groups such as Gretna Elementary students cheered as the group walked by. "I want to change Gadsden County one step at a time," said Sheriff Young. The walk should wrap up around 6 p.m. They'll be gathering at the Ring Tower in Midway for food, entertainment, and train rides for kids.